Now, lured by the prospect of thousands of small satellites needing rides to orbit, companies over the last four years have worked on more than 100 little launchers, with about 40 currently in development or testing. They have a table of 39 launchers in development worldwide, each with organization, name of rocket, country, and estimated launch date. 44 more are mentioned without dates. There is also a big table of where the funding is coming from. Much of this data comes from a watch list kept by Carlos Niederstrasser of Northrop Grumman, so at least some of the big companies are paying attention. Foremost are are the ones that are working already: Pegasus, Minotaur, Rocket Lab, plus they say 3 Chinese vehicles are operational. Of the "upcoming soon" the ones they treat most seriously seem to be Virgin, Vector, Relativity, and Firefly. Everyone sees a shakeout coming, and a huge first-mover advantage. The CEO of Firefly says "I’m really glad Rocket Lab has a 150-kg launcher because if they were launching a 1-metric-ton now at the [flight] rate they’re talking about, it would be very difficult to justify these companies.". The same Carlos Niederstrasser gave a paper at the 32nd Annual AIAA/USU Conference on Small Satellites which has this list, albeit the one below is sorted by launch date. Beyond the six demonstrated system, several are past their "Latest Launch Date" only a few, like Launcher One, showing likelihood of making their dates. Has anyone heard about Zenovision of Long Beach, California? I just stumbled over their web page. Next to suborbital plans, they also have orbital launchers announced, though no technical details provided besides targeted payload mass to unspecified orbit. Partners bring in their expertise in underwear, art and eyewear (next to lens maker Tamron)! Their listed corporate address in long beach is a 'virtual office' space. I've also been unable to find a company of the name 'Zenovision' registered in the US, the state of California, or in Germany. There's a 'Zeno Vision' in the UK but that's an unrelated software company. At least that "black engine" technology they are refering to is real. "Transpiration Cooled Ceramic High Performance Rocket Engines"
- CMC supersonic nozzle extension. Hypersonix from Australia. Spartan launch vehicle with Boomerang reusable first stage. 150 kg to SSO using expendable third stage. 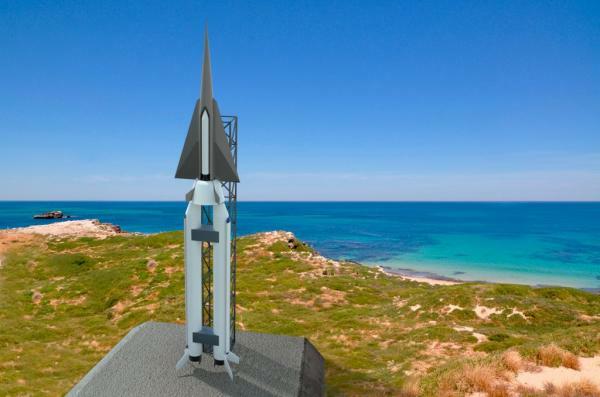 This scheme has been presented before by Heliaq as the Austral Launch Vehicle. Looks pretty complicated. 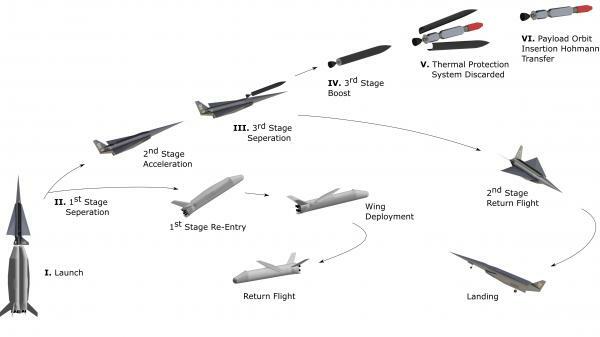 150 kg to SSO in a 3-stage configuration (with the 3rd stage being "big" compared to the small kick stage of electron) with two reusable stages with different technologies each (rocket based and scramjet based): definitely a challenge! Interesting. We've had a couple of relative latecomers now announcing ~1ton to LEO launch vehicles, counting ABL and now Isar. I'm calling them "latecomers" to mean that they appear to not have made or tested much hardware, putting them well behind both Firefly and Relativity- but both of them intend to launch by 2021, so perhaps they've done more development than I know about, though my cynical side says those dates are not at all realistic. Looks like Isar's launch vehicle architecture is conceptual because although they do list the thrust of a single Ariel engine, they do not show the aft end of the vehicle and list its thrust as "plenty." Maybe these guys have an interesting angle with ITAR though. LOL "circumventing ITAR". Nothing gets the USG in a tizzy much more than someone pointing out how they are circumventing the USA's global reach. I saw a comment a couple of days ago about the "great consolidation" now Rocket Lab is starting to fly regularly, and I do think that is an interesting topic. We certainly start to see some companies failing for various reasons e.g. Aphelion, ARCA, XCOR. I guess we could add some international names to that list as well like OneSpace, Landspace, PLD, Gilmour, Interorbital Japan and Orbex Space but I leave that area alone for now. What has changed? Who is going down in flames, who has risen like a pheonix? As he watches his competitors, Beck says he can get a good idea of how far the companies are coming along. "If they're making a big song-and-dance about engine tests, you know they’re miles away," he said. Even full stage tests, he says, is an indication that they're a long way away. He's right. I think in all these markets if you are just starting to test engines or haven't even got to that point you are basically dead unless your uncle is a billionaire. Everybody talks about consolidation, but actually the only companies that will really consolidate (i.e. die) are those that started too late to have any chance - most of the others who started 3-5 years ago are way behinf Rocket Lab but are far ahead of new groups. They have money, customers, technology, staff - such that when the new guys show up there is no investor money left available, all the customers are locked in, the key staff have jobs, lots of innovative tech has IP protection. But I don't see all the 100+ projects dying - many are just dreamers who will keep going, pretending they have a chance for decades with a website and a story but no money or real technology. There a few like that in every list. Its taken RL two years from first launch till reaching commercial operation where they can launch monthly. While they didn't have LV failure as such, still had technical problems that set them back ie engine controller issues. I expect their competitors to still take at least a year to get up to speed assuming trouble free test launches. I used to say "If the company is talking about how they are going after suborbital flights or the "sounding rocket market" then they are years away from getting to orbit..."
I used to say "If there company is talking about how they are going after suborbital flights or the "sounding rocket market" then they are years away from getting to orbit..."
I think the point that PB is making is that we have a plethora of rocket companies acting like they are in a race to reach orbit, but really, they are in a race to own a market. Arguably, the distance from a company that has one orbital launch to launch provider is greater than the distance from startup to company with one orbital launch- especially in terms of man hours and in terms of dollars. Rockets are impressive, and more than one company has turned them into a show for VC dollars. But the race is longer and harder than any of them tells the VCs. The companies that are in real danger of "the great consolidation" are the ones with a high burn rate that need to raise more money. There's kind of a point where it's hard to return from, where you commit to a market that may or may not ever exist, with a vehicle that may or may not ever work. At that point, you have a very limited time to make it work in not just a technical sense but an economic one. The poorer companies with a lower burn rate can look for a different angle, maybe try to sell only a piece of a launch vehicle (engines are in- but someone could make actual money off avionics). The actually successful ones can rely on actual cash flow to attempt a pivot. Godspeed to all the companies that find themselves in the middle. Previous video on ARCA constructing their test stand, propellant tank and engine. Latest ARCA video showing integration of the engine test avionics. No one in the West wants to "circumvent ITAR"
What they mean is circumvent the American interpretation of ITAR rules which is very expensive and very US-centric. XCOR's Congressional Liaison called the closest thing they've ever seen to a protection racket, with it's prior restraint of free speech. What other interpretation is there except the American one? We write the rules, we get to interpret them (for the greater good, obviously). No company stays in the gap between "reaching orbit" and "becoming launch provider". Also no liquid rocket company stays between 100km Karman line and orbit (Armadillo achieved 82km before quitting). Some solids exist in this range. Up aerospace lived as a sounding rocket company for 12 years and launched 12 customer flights up to now. Maybe it's impossible to reach orbit without being prepared as a launch provider, technically, financially, and in terms of team and management. From 1950s to 1970s, many national programs seek to "reach orbit" as the only goal, e.g. Vanguard. They are also large and expensive programs. Ok, sure, at least not historically. Not on purpose. But when you have a hoard of companies with minimal funding racing to get to orbit with whatever the hell vehicle they can throw together, you might have some of them unable to progress even after success reaching orbit. Even if not, as others have pointed out, there's a serious time lag between getting a single vehicle up and actually being able to sell a reliable product. If you're rocketlab, looking back over your shoulder at 100 different companies that claim to have the same goal as you, it's good to know that you're that far ahead. Whether or not that's the easy part is kind of immaterial to whether it's expensive or time consuming. I think this is just a weird concept. There are technical barriers that could potentially exist between these two states- say you've got a stage sep sytem that works 50% of the time- sure you get to space but how often? And financially it makes perhaps even less sense, as it's easy to imagine a vehicle that just isn't that competitive economically getting pushed out of the market without selling much at all. Despite not seeing why that would be the case, I'll still hope that you're right- would be a shame to see someone fly and then go home without doing what they came to do. If your rocket is designed to be a product, following the standard rules of aerospace program, e.g. TRL, then the reliability risk after reaching orbit is minimal, only 1 or 2 final levels of TRL. VC could cover this risk up to now (before really harsh market competition comes). If you skip the rules and race to orbit with something not so professional, you get trapped halfway in endless failure modes. The best maybe something similar to Japanese L-4S or French Diamant: cheap per launch, too coarse to be a product, discarded after reach orbit, but LOTS of failures and expensive total cost. Being pro is cheaper than being amateur to reach orbit. Moreover, VC would select pro companies designed for product, instead of amateurs racing for orbit. If you tend to fly and go home, no chance. VC could even invest for team instead for things. VC selection is especially true in China which have a brutal competition culture: >3 powerful companies with sub billion investment and ex pro teams headhunted from national system (headhunting caused national media conflict). Only 1 amateur company alive up to now: Linkspace (the first one, Armadillo analog, nicknamed as cheats). In rest of the world, the number of amateur companies (e.g. Garvey / Vector) is larger than the number of financially powerful companies with ex pro teams. Questions: When and how did Rocketlab team shifted from amateur to pro?